Barbara Bozzuto lost her way on her first visit to St. Agnes Hospital, which led to a satisfying discovery. “I came on board in 2002, and got lost the very first time I walked in,” Mrs. Bozzuto said. “A maintenance worker asked, ‘Can I help you?’ He started giving me directions, then stopped and said, ‘I’ll show you.’ Up the elevator, down the hall we went. Mrs. Bozzuto related that introduction a few days prior to her Aug. 18 installation as chair of the board of directors at the hospital in southwest Baltimore, where she succeeded Albert “Skip” Counselman. Mrs. Bozzuto is a philanthropic fixture in Baltimore and a parishioner of the Cathedral of Mary Our Queen, Homeland. Her background in marketing and communications figures to be of value as St. Agnes sharpens its brand, raises $25 million in a capital campaign and completes $212 million in improvements. That included some of the first-ever appeals to physicians and other staff at St. Agnes, which employs 2,987. Asked about the hospital’s calling cards, Mrs. Bozzuto mentioned the busiest bariatric unit in Maryland and its breast center. “If a woman develops breast cancer, she used to have to take her chart to an oncologist, then to a radiologist, then to a surgeon,” Mrs. Bozzuto said. “That takes a terrible emotional toll on a woman. Mrs. Bozzuto said that St. Agnes needs to do a better job of promoting itself. She described details of a $212 million renovation, which will include the construction of two parking garages and a patient tower with 120 private rooms. “I have no overwhelming credentials that make me suited for this job,” Mrs. Bozzuto said of her volunteer position, “except for a love of the institution and a vision to want to move it forward and continue the good work that has been done here for 146 years. That would be Bonnie Phipps, a Baltimore native who is the president and chief executive officer at St. Agnes. 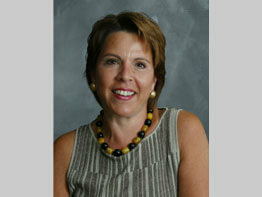 Its chief financial officer is Rhonda C. Anderson, and Dr. Carole Miller directs the cancer center. Sister Ellen LaCapria, D.C., the vice president of mission integration, continues the presence of the Daughters of Charity, who founded St. Agnes in 1862.